Prices reflect a discount that is provided to our local customers. Some handmade items may be priced higher when purchased via Etsy/email to be shipped. WA state sales tax (8.7%) will be applied at the time of purchase - this is not included in the listed prices. For anyone intending to purchase supplies along with a baby hedgehog, orders must be placed 1 week prior to the scheduled date of pick up for the hedgehog. If you need an order filled by a specific date that is different than the pick up date for your hedgehog, please contact us 7-10 days in advance. We will do our best to accommodate these requests! Handmade items are also available through our Etsy shop and can be shipped. Some of the other items listed here can be shipped as well. (Due to size, starter kits can only be shipped without the bin included.) Delivery is also available locally. Please inquire for details. We occasionally have other, "gently used" supplies available (limited quantity). If there's something you're looking for and it's not listed on this page, let us know - we may have it! If not, we can point you in the right direction. Feel free to contact us at volcanoviewhedgehogs@gmail.com with any questions. ﻿Here at Volcano View Hedgehogs, we feed our hedgehogs only the best - a mix of 4-5 high quality dry cat foods tailored to their specific dietary needs. This is also the same mix that all of our babies are introduced to before going to their new homes. The exact formula sometimes varies, but it always contains multiple protein sources, 30-32% protein, and 10-12% fat*. Because hedgehogs are so picky, it's highly recommended to use a mix of at least 2 foods in case one of them is recalled or the recipe is unexpectedly changed. However, we know that buying several bags of food at a time for such a small animal can be expensive. It can also be wasteful when the food expires before it can all be used by a single hedgehog. This is why we sell our food mix - so you can get exactly what you need, and how much you need, for a reasonable price! Need it shipped? Place your order below! Food purchased after 9/28 will not ship until 10/13! Food orders are shipped once a week and typically arrive within 7-10 business days. Please plan ahead and place your order when you have at least 2 weeks of food remaining. Please note: In order to abide by WA state law, the foods in this "mix" are not combined together before the purchase. You will receive the individual foods in their own bags (in the correct proportion for the amount you have purchased) to be combined in a large bag (also included). The individual bags include the original labeling with guaranteed analysis and ingredients. These foods are already registered with the WSDA and we do not manufacture pet food. * For hedgehogs that are extremely active, we can adjust the ratios to provide a higher fat content. This can be done upon request, at no additional charge. ** The estimate of how long food will last is based on an average adult intake of 1.5-2 tablespoons per day. This mix of treats is sure to tempt even the pickiest hedgehogs! Use it outside of the cage while bonding, or added to the staple diet of kibble for extra variety. Treats can also be scattered in a dig box or put in a small Kong toy to encourage a hedgehog's natural foraging behavior. Contains three kinds of high quality kibble, dried beef liver (chopped to a small size), and dried mealworms. Tested and approved by Volcano View's own hedgehog herd. Approximate combined values (by weight): 37% protein, 19% fat, 3.5% fiber, 11% moisture. Hedgehogs are technically omnivores, but they have a strong leaning toward an insectivorous diet in the wild. Feeder insects make an excellent addition to your hedgehog's diet - they can be fed daily or as an occasional treat. Use them to add variety to your hedgie's diet, as a treat during bonding time, or to encourage your pet's natural foraging instincts. Live insects purchased from us come directly from our personal, farm-raised stock. Unlike the live feeders you find in stores, these are healthy and gut-loaded with a variety of fruits and vegetables - nutrients that go straight to your hedgehog when they're eaten. Sorry, we do not ship live insects! A list of recommended sites for ordering live insects can be found here. Mealworms are a favorite among hedgehogs. and they are very easy to keep. Best for use in moderation because of the higher fat content. Live mealworms come in a small container with edible grain "bedding". They can be stored in the fridge for up to 1-2 months in a dormant state. Availability varies. 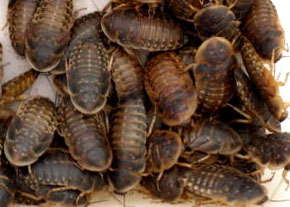 Dried mealworms are a better option for squeamish owners. They do not have to be refrigerated and will not go bad. Dubia are by far the best feeder insect. Ideal for feeding daily. Availability may be limited as our colony is established. For your convenience, we sell three kinds of starter kits. The "basic" starter kit comes with the essentials your new hedgehog will need, the "full" starter kit includes some suggested accessories as well, and the "deluxe" starter kit includes an abundance of extra items for your hedgehog to enjoy. All of these items are the same as what we use for our own hedgehogs. The only thing not in any of the kits is heating supplies, because we know that heating options can differ based on the owner's preference - therefore heating items will need to be purchased separately. If you are interested in purchasing a starter kit along with your hedgehog, please let us know by email at least 7 days in advance. This will help us to make sure we have all the items in stock when you arrive. For bags and liners included in these kits, color/pattern based on the gender of the hedgehog. because of the number of orders we have to fill at any given time, we cannot promise anything! based on the current availability of the items at the time of purchase - there is no guarantee that this will be possible. Starter kits can be purchased for use with a different cage (no bin included). Pricing varies according to cage size. Please inquire by email. Starter kits can be shipped! Due to size considerations, shipping does not include the bin. A 105 qt. bin must be purchased separately. For shipping of starter kit items, please contact us - you will be sent a PayPal invoice for the total cost (payable by debit/credit card). Shipping includes postal insurance against loss. Due to a recent increase in shipping costs by the USPS, the shipping listed below is approximate. Please include your zip code with any inquiries so we can provide an exact shipping quote! Starter kits can be purchased with C&C cages instead of bins. These prices include everything in the chosen starter kit (minus bin), the C&C cage (fully assembled), and liners of the appropriate size and quantity. C&C cages are a great cage option for hedgehogs, made from storage cube squares and coroplast (corrugated plastic/sign board). They're a step up from the basic bin enclosure offered in our starter kits, with plenty of extra space for exploration or extra accessories. C&C cages are fully assembled here and ready to take home. The storage squares are tightly secured with zip ties. The floor is made from coroplast, and the walls are lined with 9" of coroplast to discourage climbing. Perfect for liners or the substrate bedding of your choice. Custom sizes available - please inquire for prices! This cage is approx. 8 square feet (4' x 2') with a canvas bottom. A great option if you want something more spacious, or for housing two females together. Please note: for your hedgehog's comfort, a cage this size should have multiple hideaways, accessories, and toys to fill up most of the floor space. It may also be more difficult to keep heated correctly, especially during colder months. Price is variable because we order these from more than one supplier. Please inquire for the current price. Prices for larger space heaters can be variable based on different suppliers. If the price will be different than what is listed, you will be notified in advance. This compact, 1500-watt heater will effectively heat the immediate area but not an entire room. Best used for extra heat when you have your hedgehog out for playtime. It can also be used to heat a small cage with solid walls (i.e. sterilite bin). Note: Based on availability, a comparable heater of a different brand/model may be substituted. This low profile, 1500-watt heater is perfect for heating a small room (up to 300 sq ft) to comfortably maintain the necessary temperature for your hedgehog. The built in thermostat works to keep the room in a range of 2-3 degrees. Features: thermostat with digital display, auto shut-off with tip over protection. This is one of the best ceramic heaters available, capable of heating rooms that other heaters cannot cope with. The oscillation provides widespread, penetrating heat, controlled by a programmable thermostat (with 5 degree increments). Ideal for keeping a medium sized room at a hedgie-friendly temperature; its effectiveness in a very large room may vary. 1500 watts. Features: electric thermostat, multi-function remote control, overheat protection, 7-hour timer. 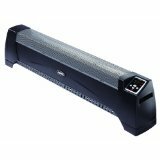 This heater has three different heat settings (up to 1500 watts) and is more energy efficient than other heaters. It runs silently and does not dry out the air like heaters with ceramic elements. The digital thermostat effectively regulates the temperature within 1-2 degrees. Features: adjustable thermostat with digital display, timer with double function, overheat protection, wheels. These ceramic bulbs effectively heat a cage without producing light like normal heat lamps. They use much less energy than space heaters. Used together with an appropriate lamp and thermostat, they can provide constant heat up to 75+ degrees. Available in 100 watt ($30) and 150 watt ($35). Note: Wattage requirements depend on the size of the cage and ambient temperature of the room. Large, open cages may require two CHEs. Most effective when the room temperature is 68-70 degrees. This clamp lamp can be securely mounted to a variety of cage types. The dome lamp spreads the heat of a CHE bulb, and the reflective inner surface directs heat downward. Also perfect for use with standard bulbs. Rated for 150 watts. 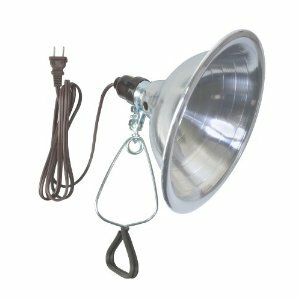 This clamp lamp has a built-in dimmer, for controlling the heat output of a CHE bulb manually. The dimmer switch allows you to adjust the CHE bulb from off to full power, and anything in between. A less expensive alternative to using a thermostat, but slightly more involved - to be effective, you must check the cage temperature at least once a day and make adjustments when necessary. A thermostat is a necessary part of a CHE heating system. The clamp lamp, fitted with a CHE bulb, is plugged into the thermostat (rather than directly into the outlet). 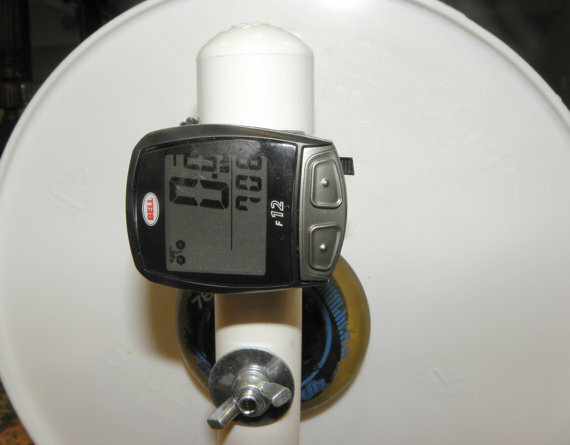 After the initial set-up to establish the correct settings, the thermostat will regulate the heat output of the CHE by turning it on and off when necessary, keeping the temperature of the cage within a range of about 2 degrees. 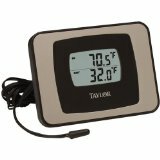 This thermostat has two ports and can control two heating elements at once, up to 500 watts combined load. This thermometer features a probe and two sensors for tracking the temperatures in two different places. Perfect for displaying the temperature of a cage as well as the rest of the room. Includes a flip-out stand for easy visibility. 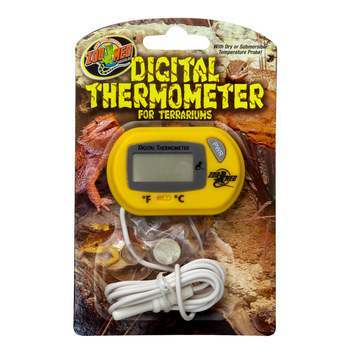 This simple thermometer is designed for terrariums and cages. The displayed temperature is detected by a long probe, which can be left discreetly within the cage. Bucket wheel (11" diameter) with a 7-week-old hedgehog. These homemade bucket wheels are perfect for hedgehogs! They have a smooth running surface that is safe for little hedgie feet and easy to clean. They are much quieter and sturdier than store-bought wheels. 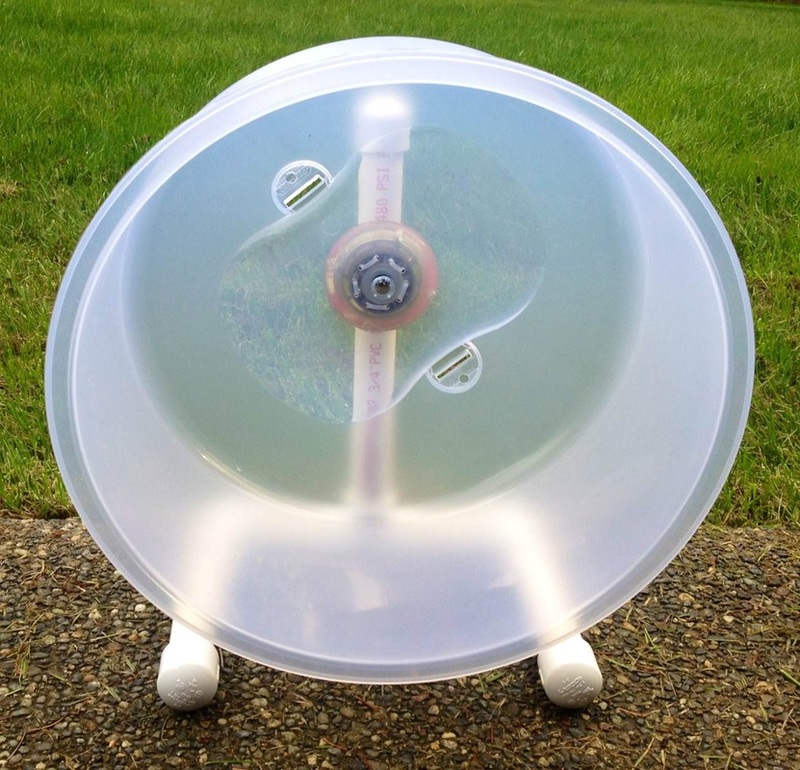 The wheel measures 10.5-11" in diameter (depending on the color) and the running surface is 5" wide. The total height is about 12". The base is approximately 7" x 10". A plastic litter tray can be included - $30 for the set. The tray measures 12.5" x 10.5" and the sides are about 1" tall. Perfectly sized to fit under the wheel, and easy to clean. Tray colors: black, red, white (out of stock), seashell. This item can be shipped and is available in our Etsy shop. These wheels contain a small bicycle computer that will track how much your pet runs on its wheel for you. You can check and reset it whenever you like. The computer comes configured for the size of your wheel, and includes the original instruction sheet for the computer as well as a small guide for reconfiguring it if ever necessary. The computer is attached to the back of the wheel with sturdy zip ties, and the sensor is attached to the wheel with an epoxy. All the colors of our normal bucket wheels are available to have an odometer attached. Cake cover wheels are slightly larger than bucket wheels, and just as ideal for hedgehogs. A litter tray can be included - $30 for the set. A litter tray in the cage is essential for "potty training" your hedgehog. These trays are designed to fit underneath the base of our bucket wheels and cake cover wheels (or other similarly sized wheels). This style of litter tray is much more effective and more consistently used compared to corner litter pans or trays that fit only under the rotating portion of the wheel (not the base). There is enough room to catch runoff from the wheel, and hedgehogs quickly learn to seek out the tray as a litter area even when the wheel is not in use. Made from durable plastic and easy to clean. The edges are smooth and completely safe. Extra large litter trays (approx 14" x 12.5") also available for $10. Color options: black or white. An assortment may be available for purchase when you pick up your hedgehog (not guaranteed). Sleeping bags or "hedgie bags" are a perfect, cuddly bed for any hedgehog. Many hedgehogs prefer these bags over igloos or other hard-sided hideaways. They're also great for out of cage cuddling and bonding time. Our sleeping bags are fully reversible and machine washable, and guaranteed to not have any loose threads. Made in fleece and cotton, all fleece (double-layer), or all cotton. 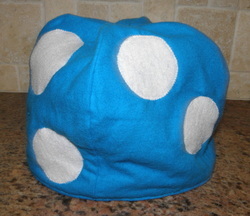 Approximately 10" x 11"; some size variation depending on the fabric used. This item can be shipped. Available in our Etsy shop. These carry bags are perfect for carrying your hedgehog with you hands-free around the house or taking with you on trips out of the house. They are similar in design to our sleeping bags, with the addition of a strap so they can be carried over the shoulder, as well as a flap that helps to keep your hedgehog from climbing out. The strap is attached securely. The exterior is made of cotton/flannel and the interior is lined with fleece. Machine washable. Approximately 10" x 12". The strap is fairly short (about 30") to keep your hedgehog within easy reach, however, made-to-order bags can have a longer strap upon request. These bags may not always be available when you pick up your hedgehog. To be sure of availability and for specific color/pattern requests, please email us 2-3 days in advance. These bags are great for carrying your hedgehog. They can be used to keep your pet close for hands-off bonding and socialization, or as a discreet carrier for trips outside the house. The cozy interior gives your hedgehog a feeling of security, deep enough to discourage them climbing out, while still letting you easily view or pet them. 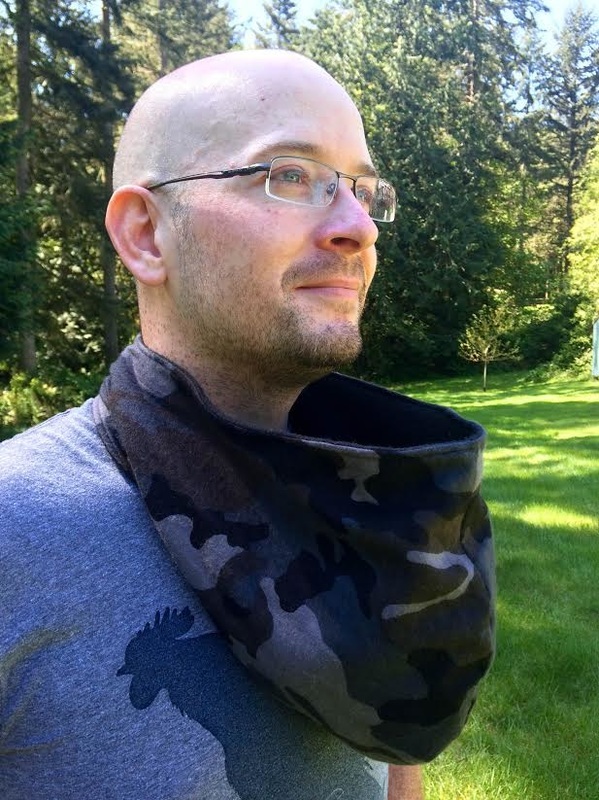 The durable strap can be worn over the shoulder or across the chest. These can also double as sleeping bags within the cage. Designed with no rough/frayed edges or loose threads, to protect your pet's feet. The exterior is made of cotton/flannel. The interior is lined with fleece. Machine washable. Approximately 10" x 11". 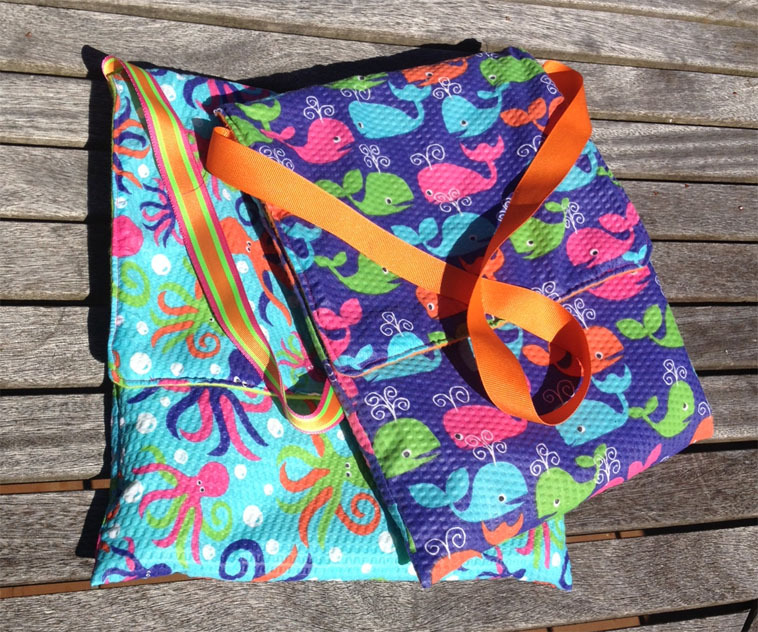 These bags are fully reversible. Strap is approx. 30" by default to keep your pet close, but can be made longer by request. This cozy "backwards" hood functions as a sling at your upper chest, to keep your pet close for cuddling, hands-free bonding and socialization, and easy use around the house. The cozy interior gives your pet a feeling of security, deep enough to discourage them climbing out (although don't be surprised if you get neck snuggles! ), while still letting you easily view or pet them. The hood is spacious enough to accommodate two adult hedgehogs, or additional fabric accessories to make it extra snuggly. The ends of the hood fasten with a strong, sturdy snap closure at the back of your neck - no need to pull it on or off over your head. These domes serve three functions: a hideaway/hiding spot, a sleeping bag, and a carry bag. They are designed to be "doorless". Your hedgie can enter easily under the edge, and the interior remains dark and provides a feeling of security. There is no boning - so these domes are flexible and perfect for use as a sleeping bag when placed on its side. 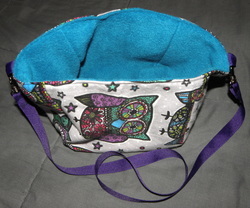 Or, turn it over for a cozy, flat-bottomed bonding bag. With detachable straps, it makes a great carry bag as well. Exterior is flannel and interior is matching fleece. Machine washable. A 4-week-old baby inside a dome. Domes can be made in solid colors or with any flannel pattern. "Toadstool" spots and detachable strap are optional. Available fabrics can be seen here. Cozy, cuddly tunnels are a great toy and cage accessory. They also double as an alternative sleeping spot and hideaway. Made of cotton/flannel with fleece interior. Machine washable and fully reversible. Available in three lengths (12", 18", and 24"). The opening is 8-9" across (flat). Absorbent cage liners, without any rough edges or loose threads. Double layer liners (all fleece or fleece/flannel) are sewn around the outer edge so they lie flat, without the "balloon" effect seen in liners by other makers. Double layer liners are thicker, warmer, and more absorbent than single layer liners. Fleece and flannel liners are made from patterned flannel with matching solid fleece. All fleece liners are available in solid colors (default) or a pattern (by request) with matching solid on the opposite side. Single layer fleece liners are not hemmed (fleece will never fray at the edges); the reduced fabric and time cost to us allows us to make these available as an inexpensive alternative to double layer liners. These are available in any solid color, or may be available in some patterns (by request). Preset and custom (per square foot) sizes are listed to the left. Custom sizes are priced per square foot. 2. For cages with dimensions not listed, please inquire for a custom size. Be sure to include whether the dimensions you request are the full cage dimensions (i.e. listed on the box) or the measured interior floor dimensions, so we can be sure of the best fit! Liners can be shipped and are available in our Etsy shop. Please contact us for color/pattern preferences or to order a custom size. Note: Hedgehog fabric or licensed character fabric will be +$0.25-0.50 per ft² to offset the additional cost of acquiring those fabrics. These blankets are the perfect size for your hedgehog. Use them for cuddling time, for a sleeping spot in the cage, or to make your pet's hideaway extra cozy and warm. These blankets have no rough, exposed edges or loose threads. Blankets may not always be available when you pick up your hedgehog. To be sure of availability and for specific color/pattern requests, please email us 2-3 days in advance. Fleece strips are the perfect outlet for your hedgehog's digging and burrowing instincts. More attractive and less messy than disposable bedding types (shavings, etc). 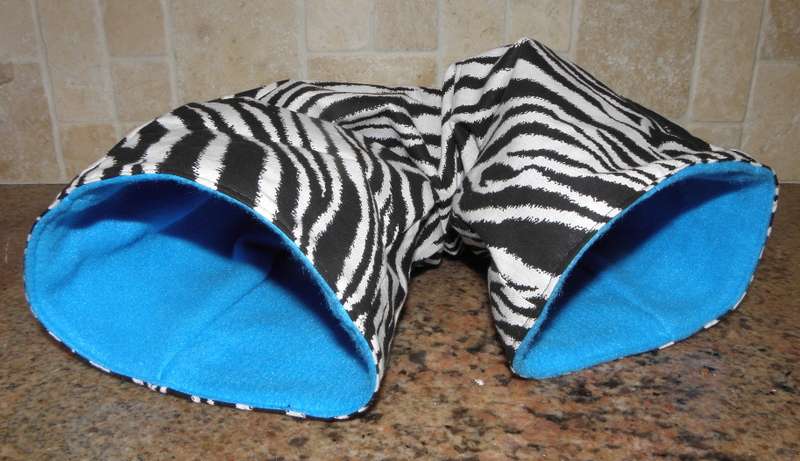 Use them inside a sleeping bag or hideaway to give your pet an extra cozy sleeping spot. Fleece does not fray when cut, so there are no loose threads or ragged edges. 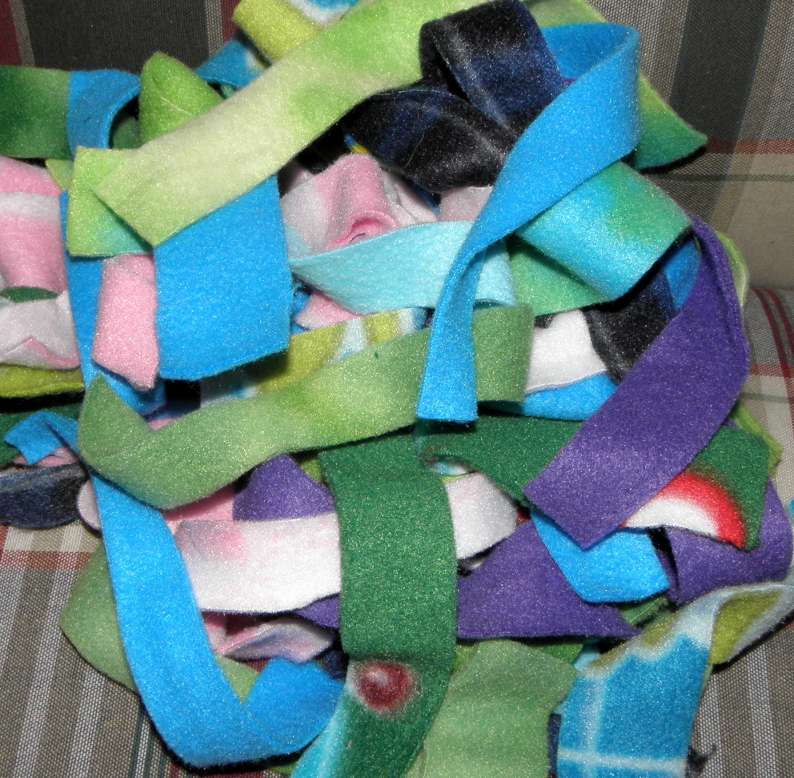 Each bag (7"x7" when flat) is packed with fleece strips. Approx 30-40 strips. Color options are NOT guaranteed. 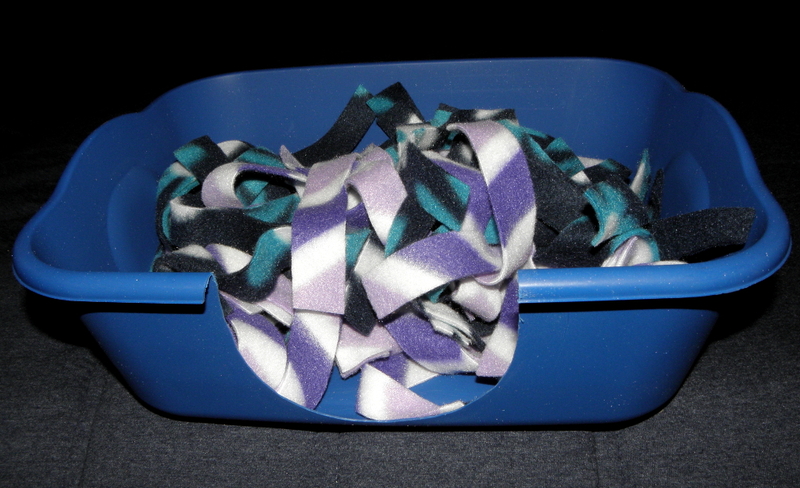 These strips are made from fleece remnants we have on hand - both solid colors and patterns. If possible based on what's available, the majority of the strips will be your color preference. If you have a color combination in mind that isn't listed, feel free to include it in a message with the purchase. NO PROMISES. You might get strips that are all exactly your chosen color, or it might be completely random. A cuddle buddy makes the perfect snuggly companion for your pet. It functions as both a toy and an alternative bedding option. Hedgehogs love to cuddle with a fleece "friend". They can be used to make a hideaway extra cozy, and are large enough to burrow into on their own. A great alternative to loose fleece strips - you don't have to worry about keeping track of the pieces or losing them in the wash.
Machine washable, tumble dry low. 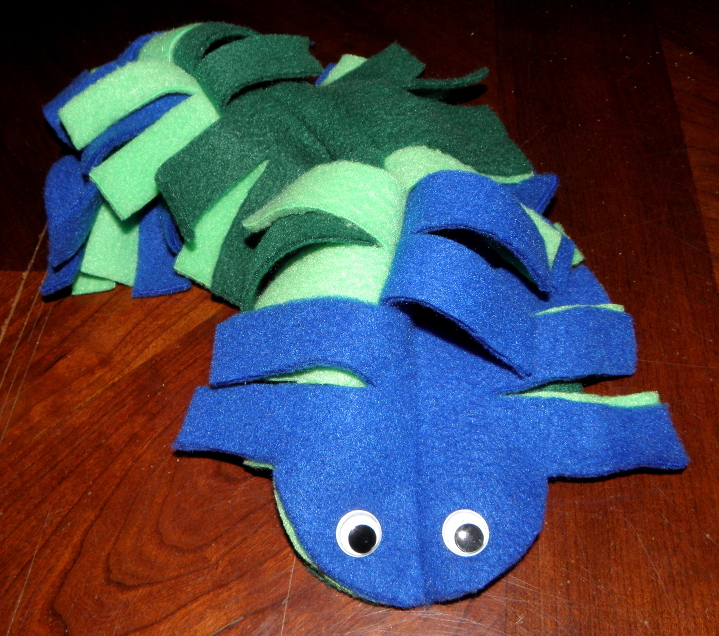 Made entirely of fleece (plus googly eyes) so there are no loose threads. Approx. 12" long and 6" wide (when laid flat). These colorful foam tubes are perfect for hedgehogs! They are much more durable than cardboard toilet paper tubes, and can be wiped clean - no need to discard them when they get dirty! The foam is slightly flexible which guarantees your hedgehog's head will never get stuck, so these tubes don't have to be cut down the middle. 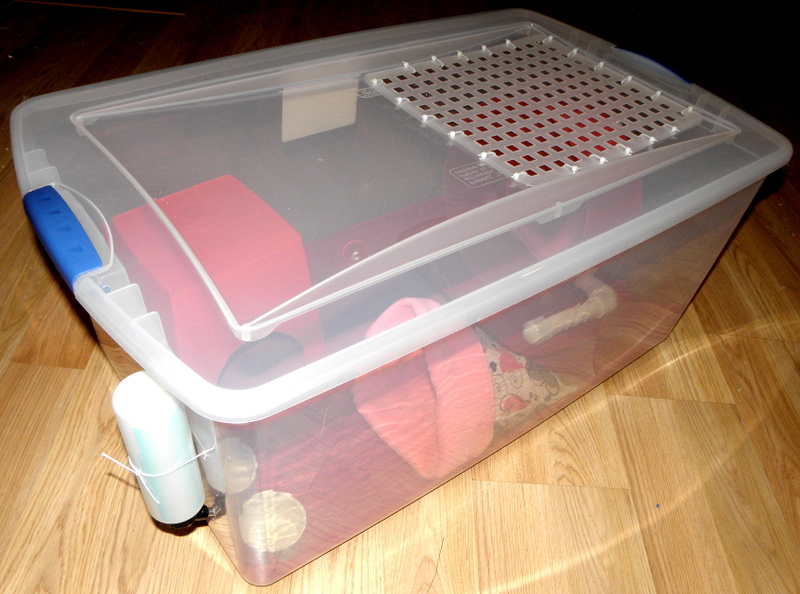 A clear, hard-sized box for safe transportation of your hedgehog, or for use as a small, temporary enclosure while cleaning the cage, etc. A great alternative to commercial hard-sided carriers - just as secure, but the clear plastic gives better visibility. These boxes have a latching lid that stays tightly shut. The lid is modified with durable plastic "mesh" to give plenty of ventilation while keeping your hedgehog safe inside. A dig box provides a great outlet for your hedgehog's burrowing instincts, without the mess of particulate bedding. Kibble, treats, or insects can be hidden to encourage foraging behaviors. It can be used inside a cage for entertainment and an additional hideaway, or as part of a playpen or out-of-cage enrichment. The plastic box is easy to clean and the sides are tall enough to contain the digging material. The curved entryway allows for easy access and has no sharp edges. Two bags of fleece strips (approx 60-80 strips) and a small mesh laundry bag (for easy washing) are included. These hand warmer covers keep hand warmers away from direct contact with your hedgehog. A must-have for travel with your pet during cold months, for extra warmth, or for use during a power outage. 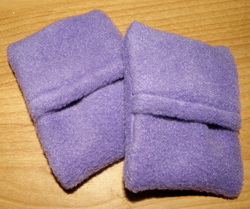 The "pillowcase" style uses overlapping edges to secure the hand warmers while allowing for easy insertion and removal. Made of fleece and machine washable. Approx 2" x 3". These will be made from solid color fleece of the color specified by the buyer. If you do not make a color selection, you will receive a random color from what we have in stock. Hand warmers are not included. This compact scale is perfect for weighing a hedgehog or measuring food. It accurately weighs in 0.1 gram increments, (up to 1000 grams) or in ounces. Features auto-zero tracking and a retractable display that is backlit and easy to read. 2.7" x 2.7"
Note: will require a small bowl (not included) to weigh a hedgehog. Hand warmers are perfect to keep a carrier or carry bag warm while traveling during colder months, to add some extra heat to your hedgehog's sleeping area, or for short-term heat during a power outage. Best used with fleece hand warmer covers to prevent direct contact. A water bottle ensures that your hedgehog has access to clean, fresh water at all times, without becoming dirtied with waste or food debris. 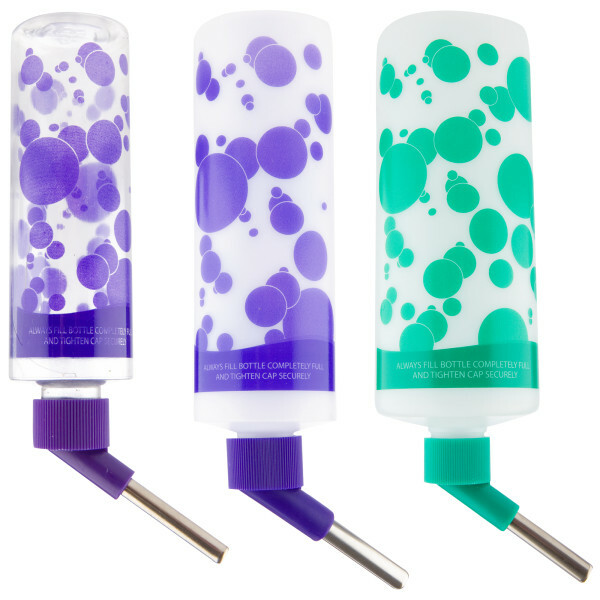 These bottles use a ball bearing so there is no risk of injuring your hedgehog's tongue or mouth. These miniature porcelain ramekins are perfect sized as food/water bowls for hedgehogs. Durable and dishwasher safe. These stainless steel cuticle trimmers are the best option for clipping a hedgehog's nails. They give much more visibility compared to small human nail clippers, and the full-hand grip allows for better control. Pine pellets are a great choice for using in your hedgehog's litter tray. They have excellent absorbancy and help control odor. When the pellets reach full absorbency, they crumble into a coarse dust which sinks to the bottom. When you clean out the litter tray, only the dust needs to be removed (and any pieces of dried poop) - any intact pellets can still be used. 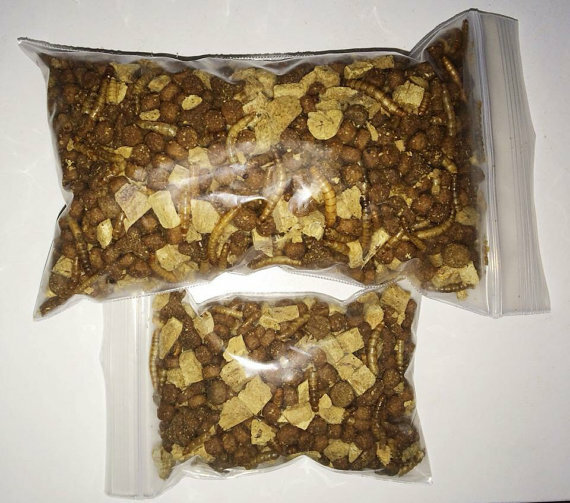 A 1 gallon bag of pellets is enough for 2-3 full litter changes. 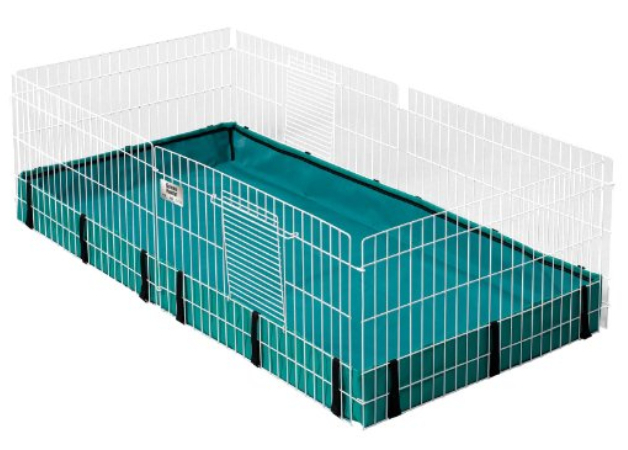 These playpens are perfect for giving your hedgehog a safe area to explore while outside the cage. The 8 colorful panels have vertical bars to discourage climbing. The panels can fold and stack together for easy storage.